If there’s one single way to please a crowd (because we’re not counting wine), Asian food is the key. Hungry? Asian food. Hungover? Asian food. The answer to the meaning of life, the universe and everything? Asian food. Luckily for you, the biggest holiday to celebrate and eat Asian cuisine is coming up! It’s practically obligatory to overindulge and feast with friends and family on Lunar New Year (Friday 16 February this year). The start of the new Lunar Year calendar is celebrated and regarded as the most important time (and meal!) of the year—think of it as a second Christmas (and who DOESN'T want that?!). So along with red envelopes (the best tradition), dancing dragons and firecrackers, the holiday doubles as the perfect excuse to cook up a homemade feast. For those who don't know: dishes and customs vary across cultures, but typically Lunar New Year food is deeply rooted in symbolism—dishes represent good luck, wealth and prosperity. There are heaps of fascinating traditions too (including the 'prosperity toss' which involves throwing mixed salad into the air for good luck). 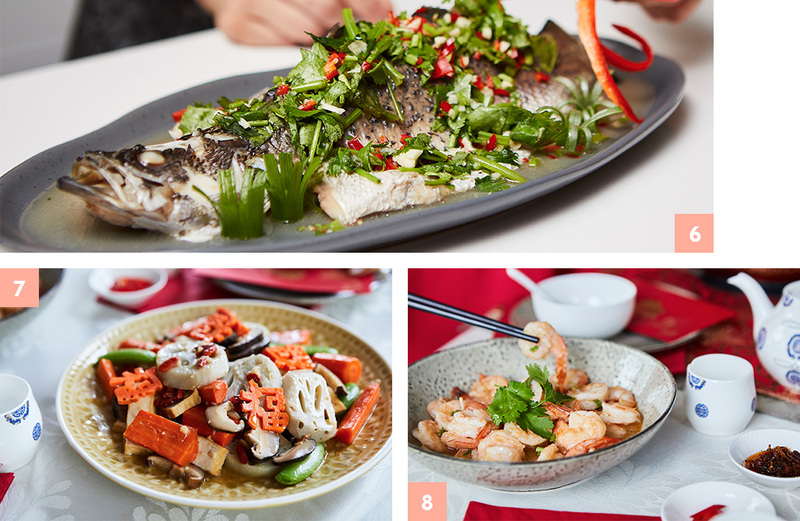 We teamed up with Asian Inspirations to bring you some of the best Lunar New Year dishes (and dishes you should have eaten already if you’re an Asian food fan). Lighter than yo Aussie pav and at least ten times as chewy, these multi-coloured circular morsels symbolise harmony and reunion (something we could use a ‘lil more of, we’d say!). You can fill them (if you’re feeling fancy) with a variety of pastes too. These sweet soup symbolises reunion and family togetherness. Hailing from Japan, these flash-wok fried chicken thighs can be served with your favourite veggies or tofu. Even the littlest in the family will be scrabbling for a piece of green bean once it’s been tossed through yakitori sauce. Symbolising togetherness and rebirth, chicken is an important dish because all tribute meals to ancestors contain chicken! Not a drill: this may be the easiest crispy pork belly recipe we’ve ever laid our eyes on. This Thai-style recipe combines coriander roots, coconut juice and Asian sauces for the best tasting pork of your life. Pork is a symbol for strength, wealth and blessings for the coming year. This Korean-Chinese recipe features finely chopped or julienned fresh vegetables around a selection of seafood, meat and sautéed noodles. Pick ‘n choose your favourites, then toss it together with sauce in your bowl for your DIY entrée. This recipe has seven ingredients and three steps, so even a ten-year-old chef wouldn’t burn this. It’s a lighter and flavour-packed stir-fry (ideal for the type of guest who will peel off pork crackling). A signature of Thai cuisine, a whole fresh white fish is steamed and topped with a lathering of spiced, sour and garlicy flavours. The whole fish symoblises abundance, but make sure to never turn the fish over—it symbolises a capsized boat and is bad luck. Instead, lift the tail up and scrape the meat out. Visit your local market or fishmonger for the best quality ingredients, and watch culinary magic happen. Three sauces and stocks are key to keeping this recipe down to a 15-minute job. That's a good thing, since Lotus Stir Fry is a must-have for any Lunar New Year celebration. You can sub in your favourite veggies at the beginning on this recipe. Prawns are sautéed in a pan and bright, vibrant lime and oyster sauces are stirred through to jam the flavours into this humble dish. This dish is served as a symbol for joy, happiness and luck in the coming year. Editor's note: This article is proudly sponsored by Asian Inspirations and endorsed by The Urban List. Thank you for supporting the sponsors who make The Urban List possible. Click here for more information on our editorial policy.